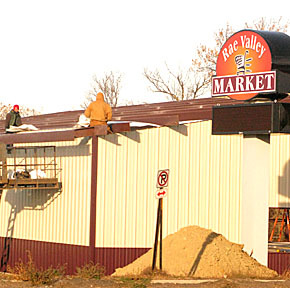 The structure of the new Rae Valley Market store is taking shape at the intersection of Highways 14 and 32 in Petersburg. Last Friday, workers were putting on the roof of the new building (above photo) after completing the siding. The new store sign is now in place and will be plainly visible along Highway 14.